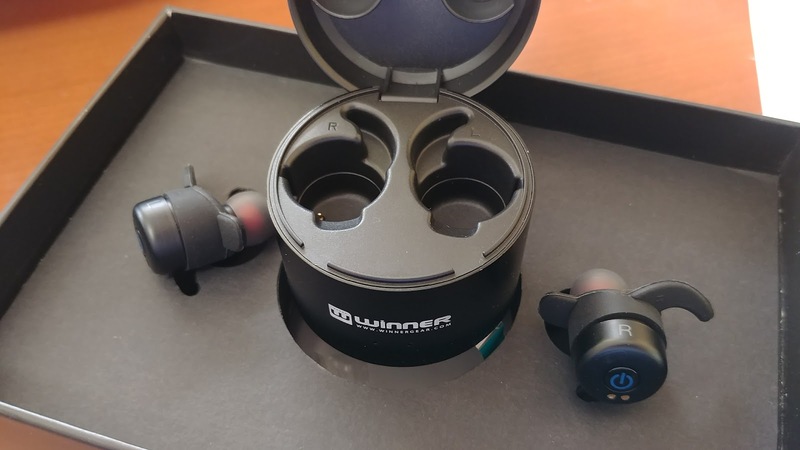 So you want to complain about missing headphone jacks? Bah... seriously, I can't remember the last time I really used a wired set. There's wireless, and then there's TRULY wireless. I remember the days of the first real sets of wireless speakers for home theatre and then folks would be upset that they still needed to be plugged in. There's always a wire. Okay, okay, so there is a cable ... to connect the charging box. But you can go hours on a charge... so hours without having to come in contact with something that has a cable. 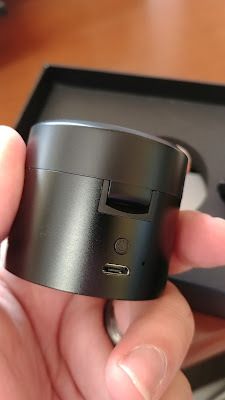 The box itself is a little battery you charge up, and it's got enough juice to apparently redo the buds 4x times over (took me a while to understand why it had the power button back there). The idea is that you plunk the buds into the charging box and when you want to use, take 'em out and plunk 'em in your ears and listen away. One is Bluetooth'd to the device, and the other is connected to the other set. Set up is a little weird, you power on one bud by holding down power, and then do the same with the other, it'll say 'connected', and then you'll be able to start listening. To stop using it, just hold the button on one of them to power it down and it'll signal the other to shut down as well. Powering on you'll need to turn them both on, so it can be a bit of a disconcerting thing to power one on, then power the other, hear it say connected, then connected again. It's neat tho'. 2 separate little bluetooth speakers essentially. It's not bad. It is quite quiet unfortunately. In trying to keep it as minimal as possible, there's no volume controls on the units, so you are dependant on the phone control. And while I'm out and about biking or running it's not quite enough to block out the sounds of cars etc.. I can still hear the music just fine, but I would have preferred a bit louder. The quality of the sound is good, just not quite at the volume I'd like. One thing that I found weird while I was biking with them was that I would have one fade in or out. And at one point it even altogether stopped. Running I never had the issue. So how about using it. It's ... different. I'm so used to a cord. A little fob doohickey to have controls. It's taken some getting used to. I'm used to biking for a while and then when I need to take them out. It's not so easy with this, I have 2 things to take out. It's just not something I'm used to. Then there's the fear of losing one. Just be extra cautious I bet. At the gym it's good, but make sure you go with something with a pocket if you want to take them out so you can put it somewhere, otherwise, 2 in one hand is a bit much or one in each hand and then holding your water bottle is tricky. Using it you can control playback by pressing the button (on either) to play pause, or double press to skip. I think one side was supposed to make it go back, the other jump forward... but I've tried and both seem to skip ahead. Maybe I should re-read the manual. 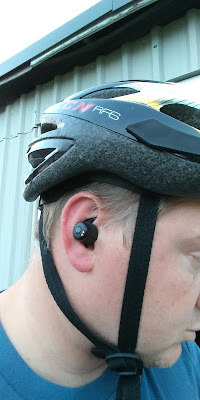 Ah well, who needs to really jump through your tunes while rocking away in your workout. You're supposed to get about 3 hours of music time, which isn't much, but that's what you get for such tiny little things. Just plop them back into the case when you're done each time. The case is pretty small and easy to take with you everywhere. Plus, it gives you a place to store the plugs when not in use and not lose them. Don't forget to hit the power button when they go back in and they'll charge up the buds while in there. Now, the weirdest thing about the case is that it seems backwards to me. Open the case up, and you'll see that you place the right plug in the left side and the right plug on the left side. Just seems backwards to me and I always get it wrong the first time I try to put them away. Anyways, at $150US it's not a simple choice to purchase. For me, I'm not sure I could make that case. I don't mind the little cord and I'm used to it. But if size really was an issue and the cord did get in the way of whatever sport I was doing, then I'd look at these for sure. The selling feature at that point is that they come with a 2 year no questions asked warranty. Anything breaks, they'll replace it. Not many headphone manufacturers offer that.